Menu button - opens left main menu. Toolbar action buttons - action buttons which can be customized by tapping on … button, and in dialog selecting Customize. If you have already hidden … button, open left main menu, go to Settings → User interface → Toolbar action buttons. Track name - name of the current shown track/route. Compass - map compass. When you tap on this compass map will be rotated so top of the map will be to the north. This button can be hidden when you open left main menu, go to Settings → User interface → Show map buttons. Location button - when tapping on this button map will move and zoom to the location overlay. This button can be hidden when you open left main menu, go to Settings → User interface → Show map buttons. Zoom - buttons for zooming in and out on the map. This button can be hidden when you open left main menu, go to Settings → User interface → Show map buttons. Start icon - icon showing start of the track/route. This icon can be changed when you open left main menu, go to Settings → Track/route → Start and End icons. End icon - icon showing start of the track/route. This icon can be changed when you open left main menu, go to Settings → Track/route → Start and End icons. Location overlay - shows current location. Track line - when you tap on track line, graph below map will be shown. You can learn more in How to show graph below map. 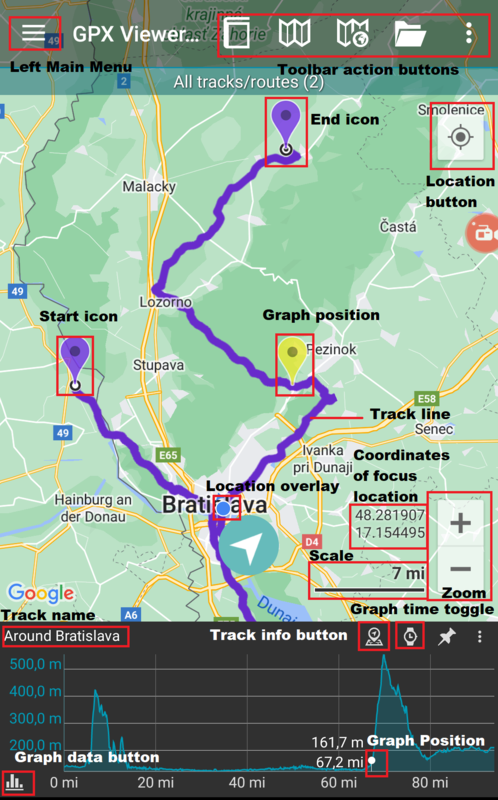 Graph position - when you tap and drag on graph, information about current position on the graph will be shown and also icon on the track/route line on the map showing position will be shown. Scale bar - shows current scale of the map. This information can be hidden when you open left main menu, go to Settings → User interface and uncheck Show scale bar checkbox. Track info button - shows information about track/route for which graph is shown. Graph time toggle - toggle whether distance or time track/route data will be shown on x-axis of the graph. Graph zoom toggle - this toggle button enables/disables whether the graph can be zoomed in or out by pinch gesture. Graph data button - button for selecting which track/route data will be shown in the graph. You can learn more in How to show graph below map. Track line color legend - shows legend of current data visualization by color on track/route line. You can learn more in How to visualize data on track line. The map can be controlled by gestures. You can move it by touching and dragging , zoom in or out by pinching gesture or you can simply double tap to zoom in, you can also rotate it by rotate gesture and adjust it's tilt by scroll gesture . These map gestures can be disabled when you open left main menu, go to Settings → User interface → Enable map gestures. Open files - by default opens screen with internal File browser of GPX Viewer by which you can open multiple gpx, kml and loc files. However if you go to Settings → File browser and check External file browser checkbox, GPX Viewer will open external app by which you can select which files will be opened in GPX Viewer. You can also learn How to open gpx or kml file. Track/route info - shows screen with information about tracks/routes. You can list all tracks/routes from opened files. Waypoint info - shows screen with information about waypoints. You can list all waypoints from opened files. Switch track/route - if you have opened file or files with multiple tracks/routes this button will cycle over these tracks/routes by showing them only one at a time on the map. Terrain map - enables terrain map style if current selected online map supports it. Only Google, first Mapbox and first HERE online maps from the online maps list supports this. Satellite map - enables satellite map style if current selected online map supports it. Only Google, first Mapbox and first HERE online maps from the online maps list supports this. Track recording (only in PRO) - toggle showing of track recording buttons in the map screen. 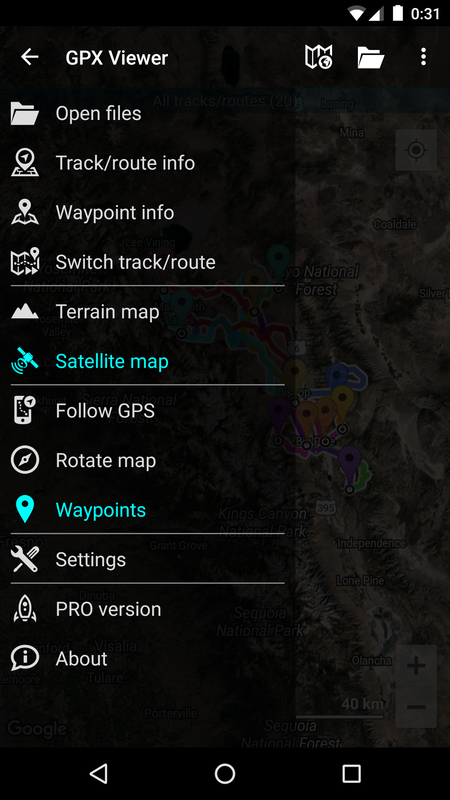 Follow GPS - toggle feature of continuously aligning map to current GPS position. By default GPS position is moved to the lower part of the screen, if you need GPS position to be centered, just go to Settings → GPS and uncheck Move to lower part of the screen checkbox. Rotate map - toggle rotating map according to device's orientation sensor. However by default this may be unstable and when this is the case, it is recommended to go to Settings → GPS and checking Rotate map according to GPS checkbox, which will use data of GPS movement direction to rotate map. Waypoints - toggle showing of waypoints on the map. Settings - opens settings for app organized into various categories. PRO version (only in free version) - shows information about PRO version - which features PRO version contains in addition to the free version features. About - shows information about the app.